Anonymous Mail is a RAD utility for email administrator's which allows you to send an email from any alias or account from your domain. $99 per copy licensed on one server. 4. When prompted, insure that the path to your post office is correct. 1. Open Anonymous Mail on the Admin's desktop. 2. Address the email to either a users name on the email system or a proper email address. 3. Address the email From a users account name, conference name, or any alias you do not need to append your domain name as the email server will append it automatically for you. 4. Fill in the subject and body of the message. 5. Click Send. Your email will be automatically addresses from your domain. 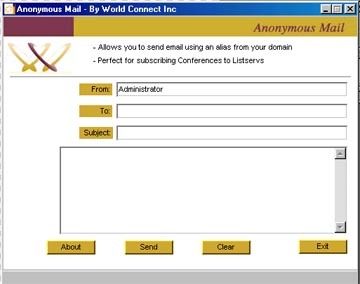 Anonymous Mail is offered free of charge on an as is basis without warranty or obligation by World Connect Inc.
To complete your licensing authorization please send an email with your organization name, contact and phone number to gatewaypro@worldconnect.com and then install the application. Anonymous Mail is part of the GateWay Pro® family of products. Some of our GateWay Pro® utility products are based on the Rapid Application Develoment Environment. These products are avaialble through a yearly subscription service (RUSS) that is designed to ensure that you receive all of our powerful utilities as soon as they are available and at a considrable cost savings.